Are you on the hunt for fall craft ideas? I’ve got you covered. I have pulled together a collection of Fall crafts that are perfect for you to create for your home this season. There are DIY Fall crafts for decorating your home, there are Fall food ideas you can make as a family and there are Fall and Halloween crafts you can make with the kids. I love them all! I pulled these ideas together from the submissions other bloggers have shared each week on The Mommy Club Party (which is hosted here on Crystal & Co., every Wednesday) as well as some of my personal favorite Fall crafts that I have shared with you guys from years past. Ready to see some awesome ideas that will have you running to the craft store for supplies? Which one will you create first? Thanks so much for featuring my Spooky Skull Wreath, Crystal! Love some fall projects! You are so welcome. Such a fun project! Thanks for linking up! Thanks Stacy. This roundup totally kicked my Fall mood into high gear! Thank you for featuring my 3-Step Fall Burlap Wreath!!! You are so welcome. It is so gorgeous! Wow, it’s hard to choose from so many great ideas! Thanks for sharing with Afterschool! Wow a great list of crafts. Thanks for posting. Fantastic round-up, Crystal! Thanks so much for sharing at After School! 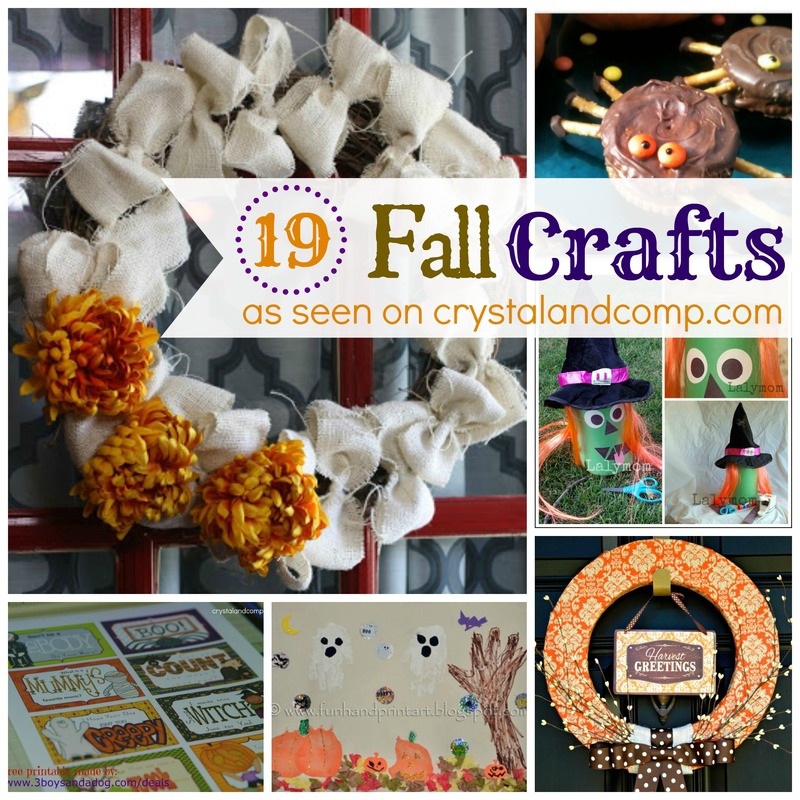 Great list of crafts! I really love the wreath. I love most anything made with burlap! Thanks for linking this to the In and Out of the Kitchen Link party. I look forward to seeing what you bring next week. I am totally digging the burlap too!